We are engaged in offering an exclusive range of Kohinoor Green Hand Tufted Carpets. 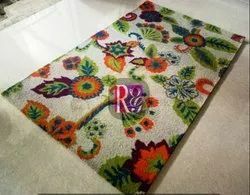 These easy to wash & clean rugs can be availed from us in different colors and patterns. Moreover, these light in weight rugs can be used to make the interior of the rooms look more attractive. Designed using natural fiber, these tufted rugs are used to keep the room free from dust. Description : Blooming designs of flowers and use of various eye pleasing colors are the main points of attraction of these handcrafted carpets. We are instrumental in providing our clients with a wide range of Hand Made Carpets. Our offered carpets can be customized on the basis of their designs and patterns to meet the demands of clients. Hand Made Pooja Carpet or Pooja assan with hand Made carpet material. Material - Hand made or Printed material with spunch.